The other weekend, I had the pleasure of going to Rhode Island with my family. One morning, we walked into town — an intersection with an ice cream stand, corner store, sandwich shop, and town green. That day on the green, vendors were setting up to sell arts and crafts, produce, and knick knacks. As I was browsing, huge ruby stalks lay on a nearby table calling my name. They were the reddest stalks of rhubarb I had ever seen. I just had to get them. So I grabbed the two biggest stalks on the table and pulled out my wallet. I spent all weekend dreaming up different rhubarb concoctions and settled on these Rhubarb Bars. The cream cheese shortbread crust tastes more like a cookie than a shortbread, and provides a rich base for the light curd above. The curd is bright, citrusy, and sweet. The rhubarb shines through, its springy taste melting on your tongue. Use room temperature ingredients — When making the cream cheese shortbread base, you need to let the butter and cream cheese come to room temperature before creaming them together. This will make the shortbread crust easier to mix and will give it a much better texture. Opt for thinner, red rhubarb stalks — When choosing your rhubarb from the store or farmers market, go for the stalks that are mostly red and thinner. These stalks will be sweeter than the thick green ones. Chill the rhubarb bars — Just like lemon bars, these rhubarb bars need to cool completely in the fridge before you can cut into them. These bars need time to set properly, sorry to make you wait! These rhubarb bars should be kept in the fridge in a sealed container. They should last up to a week if stored this way! If you plan on serving these rhubarb bars at a party, I recommend putting the serving platter on top of a baking pan filled with ice to keep these bars as cool as possible (if you’re serving these outside, at least). Let me know if you have any questions about making these tangy rhubarb bars! In a medium pot, combine chopped rhubarb, sugar, and water and heat over medium heat for 10-12 minutes, or until the rhubarb is completely broken down. Transfer mixture to a blender and puree until smooth. Set aside. Preheat oven to 350°F. Line a 9×13 baking dish with parchment paper and set aside. 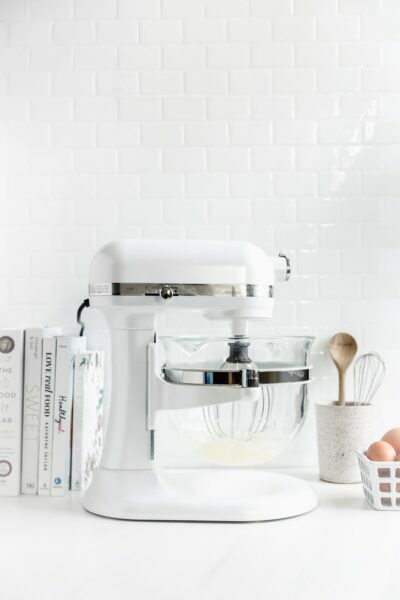 In a standing mixer fitted with a whisk attachment, cream the butter, cream cheese, sugar, salt and vanilla extract until light and fluffy, about 2 minutes. Turn mixer to low speed and incorporate flour. Press dough firmly onto the bottom of the baking dish, spreading evenly to the edges. Bake for 15 minutes. While the shortbread is cooking, make the rhubarb curd! In a large bowl, whisk all ingredients except for the flour. Use as much red dye as you’d like, and remember that the color will fade a bit during cooking. Once mixed, whisk in the flour. Pour the rhubarb curd on top of the cream cheese shortbread, then bake for an additional 20 minutes to set the rhubarb. Cool bars for at least 4 hours in fridge, then cut and top with powdered sugar! Rhubarb curd is on my list of things to make. This is a list that is ever expanding by the way. The idea of adding it to a bar like this looks delicious. This will be added to my list! Weee! Let me know what you think, Angela! Sarah these sound perfect! Love the color and I’m sure they taste sweet and delicious! Sweet and tart and perfect in every way! Thanks Mary Ann! Well I know what I’m going to do with the load of rhubarb that just made it to my crib. Yes yes yes!!! I’m so into bars and cookies, so these bars look downright magical. Rhubarb is just so magical, isn’t it!? AWESOME. Just awesome. Love this recipe and I have a friend who will love it too! Ooh, love finding recipes that friends will love too! This are soooo pretty – I love that rosy pink hue! I bet this would adapt easily to make a rhubarb curd tart, too. move over lemon bars! You have some pretty pink competition. 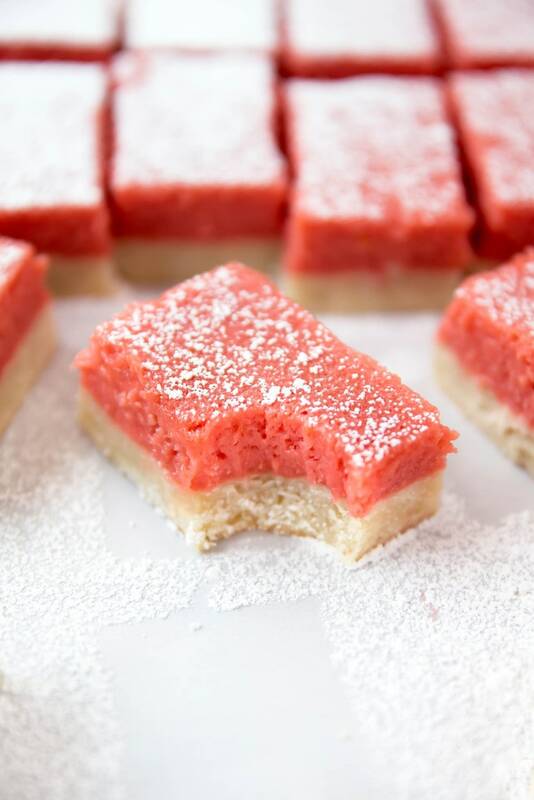 This are so beautiful, I love the ruby red hue and I can eat a whole tray of lemon bars so I know I could go wild on these! SO beautiful and SO delicious. I have leftover rhubarb from the pie I made this weekend (http://makinglifesweet.com/strawberry-rhubarb-cashew-crumble-pie/) but I will be making these as soon as the pie is gone! Oh LOVE that pie! It is so rhubarb season and I’m loving it! Oh, mommy, yes. Lately all I’ve been craving is light and refreshing sweets, and these fit the bill times 1000. 10,000. 10 million thousand! Can you believe I’ve never worked with rhubarb? I mean, I’m sure you can believe it, but like, tsk tsk yo. My mom has this story about when I was wee, sitting on the countertop in New York or somewhere with some relatives or something along those lines, eating the guts of a strawberry-rhubarb pie with a spoon. So what I’m saying is, I love rhubarb, I’ve always loved rhubarb, and now I’m going to make rhubarb stuff dammit! You’ve ignited a passion in me, Sarah! Oh yeah, hey! Long time, no comment, non? Oh haaaay! Wait but never? No no no. You’re missing out. YOU NEED TO MAKE IT! Oh my these bars look absolutely divine! That red rhubarb pinkish-red just jumps off my screen! Can’t wait to buy some rhubarb at the farmer’s market and make these. Saw and pinned these on Pinterest and I’m beyond obsessed with the bright color and the lovely presentation! Wooooow!! These are so beautiful! I really love the colours. I love rhubarb, so these are the perfect treat for me. 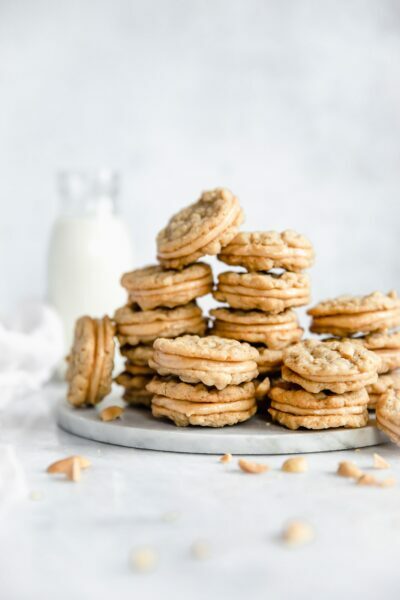 What a great recipe – you are so talented! Sometimes I just dont know what to do with Rhubarb… I mean, how many strawberry rhubarb crisp recipes can one make (although delicious)! Nice use of in season veggies, Sarah, and so unique. One can never get enough bars.. and that cream cheeeeese crust sounds just perfect! And your trip too.. what fun! I completely agree! Gotta think outside the box 🙂 And thank you, it was so nice! Oh you HAVE to! It’s one of my favorite flavors. Such a treat! This is the most unique dessert I’ve seen in a long time. 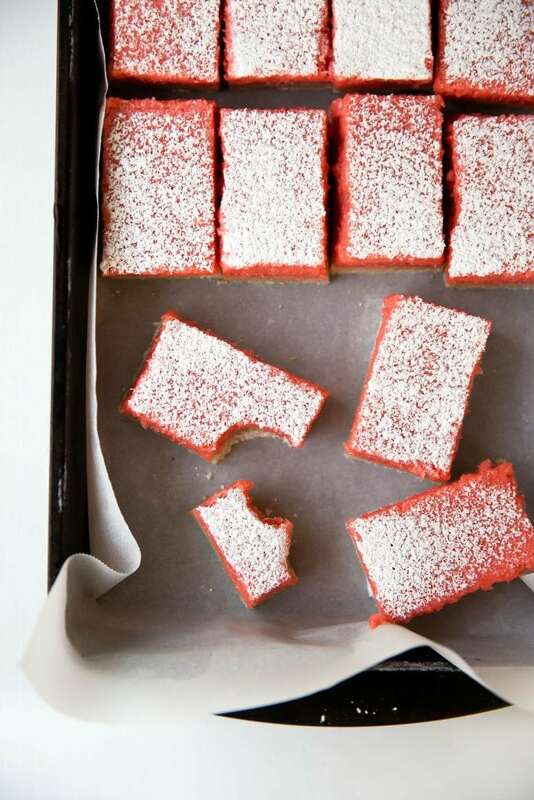 I love that you made these bars with rhubarb! I want to try them asap!! What a compliment, thank you Jen! Um. This color. It’s just to die for. Gorgeous. I would probably eat 10 of these too! Glad you had fun in RI! 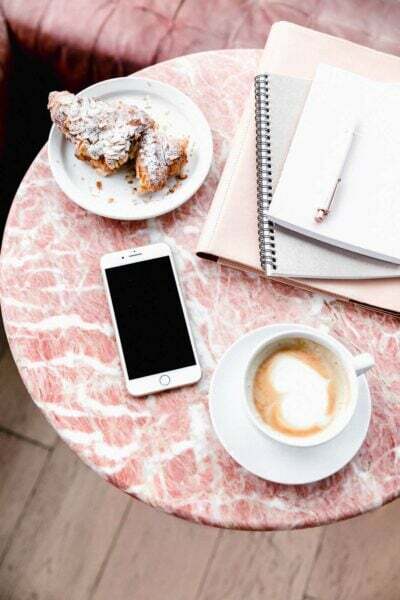 You are amazing, these are the prettiest bars i’ve ever seen – pinned and shared!! So gorgeous! I love that you made these bars with rhubarb! The color is stunning! My mom has two rhubarb plants and I can’t wait to try these! Pinning! I can imagine they’ll be even better coming from Mom’s garden! I LOVE rhubarb season!! I just bought a few too many bunches at the farmer’s market this weekend too. Love these bars!! Perfect natural color and sweet and tart combo. I’m pretty sure this is the best idea ever. LOVE rhubarb! These are gorgeous, Sarah! I love that you decided to make bars because they show the bright, vivid color of the rhubarb so well! And I can imagine how sweet and citrusy tasting the curd is – so lovely!! Sarah this is freakin genius!! Can I use regular cream cheese or is the low-fat required? good heavens, those puppies are pretty!! These bars look absolutely gorgeous! I’m in love with the pretty color and flavor. Sounds so delicious! The color on these are way gorgeous!! Love that you used rhubarb – such a unique and great idea for a classic dessert! These are so pretty – I could easily eat 10 in just a single day. I love the idea of a cream cheese shortbread too! YUM! It’s the only way I do shortbreads now! Let me guess, were you at 4 corners in Tiverton/Little Compton? These look delicious! Definitely trying a pass at these soon! Ahaha, you got it! How funny 🙂 Thanks Suzy! I wish I knew how to attach a picture, as I just pulled these beauties out of the oven. They look and smell amazing; I can’t believe I have to wait 4 hours to cut into them! 😉 Another excellent recipe, Sarah — thank you for sharing (and many thanks to the commenter who suggested using the curd in a tart; I have a lot of extra rhubarb puree that I was scheming about how to use). Hi Sarah! I made these last night for a potluck today, and they were a huge hit! Everything was perfect, I followed the recipe to the letter and it came out splendidly. Thank you so much! 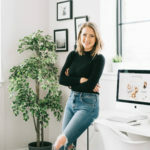 Sarah– Can I substitute gluten free flour for the regular flour?? BTW, these look totally awesome and I can’t wait to make them. I know my husband will love them. He is a huge fan of rhubarb. Hi Ann! So glad you’re going to make these- they are still talked about in our household! Though I haven’t used GF flour in this particular shortbread recipe, I would think you can easily substitute it, as it’s not that finicky of a dough. Hope you enjoy and happy baking! These look great, I only have frozen Rhubarb though, will it work or can i alter the recipe somehow? Hi! These so und amazing, I am a little confused as to what you mean for the curd with 1C of rhubarb purée, do you cook down the rhubarb and then put it into a food processor or does the processor do the trick on its own with the raw rhubarb? OH my gosh I’m so embarrassed I just reread the recipe, my apologies! I just made these with a small amount of my bountiful rhubarb this spring. They’re delicious! Thanks for sharing! So glad you enjoyed! Thanks for commenting! Would it be possible to use strawberry or some other fruit to color these instead of food dyes? Yes, some finely crushed dried strawberries or raspberries would probably work well! Do I have to use low fat cream cheese ? Thanks ! I see it calls for 1 cup of rhubarb purée. Does the 3 cups of rhubarb cook down to be just one cups worth? Or will there be extra purée? It should cook down to be about 1 cup, but for the recipe I chose to be precise in terms of how much you add in! Do you wait for the crust to cool before you put the curd on top? No, you can put it right on since it goes back into the oven. I use a lot of rhubarb, and this looked very different than most recipes I’ve tried. The final product was not very good however. Sorry. Crust was awful. Without that crust it would have been so much better. I could not stop eating the filling before I cooked it! It was really delicious. It was not as good after cooking it. My husband also didn’t like the dish. I hate to leave negative comments, but also I don’t like to read 93 comments and no one has actually MADE the product. I will make the purée again. That was YUM. Hi! Is it possible to freeze the bars, and Howard long can I store them in the fridge? I wouldn’t freeze them, seeing as the texture would get weird when they thaw. You can store them in the fridge for up to a week.